Samsthan has organised the 13th session of Madhya Pradesh History Congress on May 14-15, 1979 at Sitamau. Erstwhile Education Minister, Shri Lakshminarain Yadav of Madhya Pradesh had inaugurated and Vice-Chancellor, Shri Prabhakar Narain Kavathekar, Vikram University, Ujjain presided. About 50 historians from various regions participated. 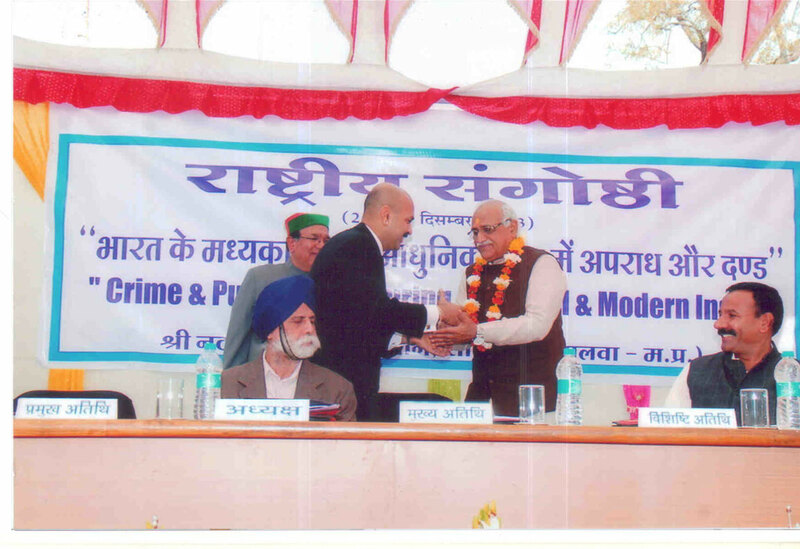 On December 25-27, 2013 three day national seminar on “Crime & Punishment During Medieval & Modern India” was held at Sitamau. Member of Rajya Sabha, Hon’ble Shri Raghunandanji Sharma, Bhopal, had inaugurated and Ex-Chairman of the History Department of Jawaharlal Nehru University, New Delhi, Prof. Dilbagh Singhji presided. About 90 historians from various regions as Gujarat, Maharashtra, Uttar Pradesh, Jammu Kashmir, New Delhi, Rajasthan, Uttarakhand, Madhya Pradesh etc. participated. On December 27-29, 2012 two day seminar on “Unpublished Manuscripts and Historical Documents of Medieval & Modern History of India (With Special Reference of Regional History)” and one day symposium on “The History of Medical Science & Health Services in India (Through the Ages)”, were held at Sitamau. The Former-Director of State Archives, Bhopal, (M.P. ), Dr. S.D. 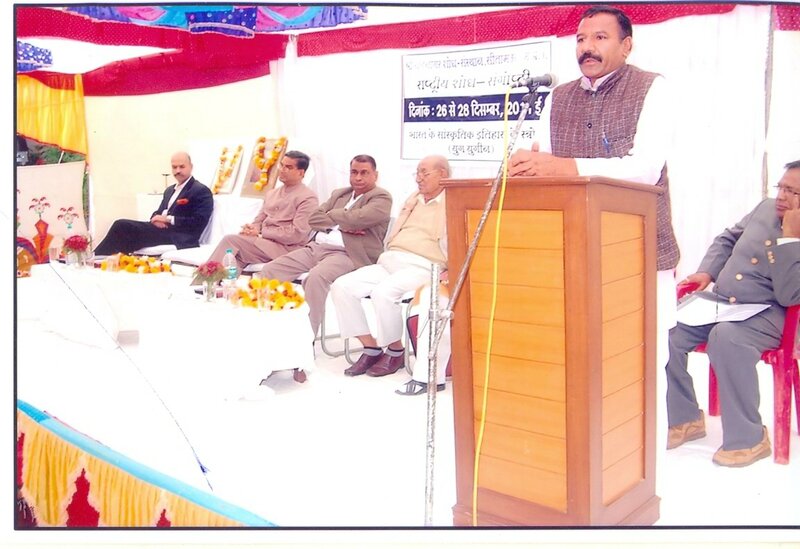 Guru, had inaugurated and Ex-M.P., Dr. Lakshminarayanji Pandey, Mandsaur, presided over. About 76 historians from various states as - Gujarat, Maharashtra, Uttar Pradesh, Jammu, Kashmir, Punjab, New Delhi, Rajasthan, Uttarakhand, Madhya Pradesh participated. On Devember 26–28, 2011, three days seminar on “Sources of Cultural History of India (Through the Ages)” was held at Sitamau. The Ex-Vice Chancellor, Prof. G.S.L. Deora, Vardhaman Mahaveer Open University, Kota (Rajasthan), had inaugurated and MLA of Suvasara, Distt. Mandsaur, Shri Radheyshyam Patidar, presided. About 111 historians from various region as-Gujrat, Maharashtra, Utta Pradesh, Jammu & Kasmir, New Delhi, Rajasthan, Uttarakhand, Madhya Pradesh participated. 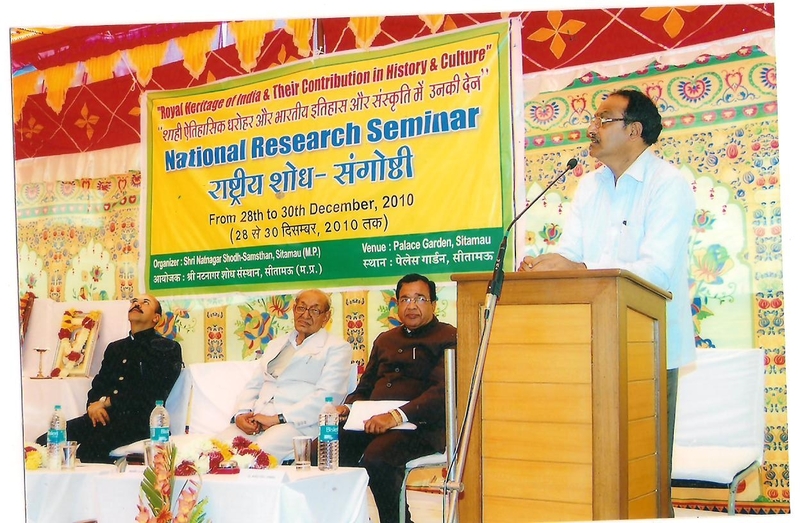 On December 28-30, 2010 A.D., Three day National Research Seminar on “Royal Heritage of India & Their Contribution in History & Culture”. On December 27-28, 2009 A.D., Three day Seminar on “A few known or unknown Historical & Cultural Important Monuments of Madhya Pradesh & Adjoining States” was held at Sitamau. The Seminar was inaugurated by Dr. Laxminarayan Pandey Ex. M.P. and Special guests were Mandsaur M.L.A. Shri Yaspal Sinh Sisodiya and Suwasra M.L.A. Shri Radheshyam Patidar. The closing ceremany was presided by Prof. B.S. Garg the Chancler of Janardhan Rai Nagar Rajasthan Vidhya Peeth University, Udaipur (Raj.) 74 Scholars of History from various regions participated. From February 23-26, 2008, a four-day seminar on birth centenary of Maharajkumar Dr Raghubir Sinhji was held at Rajniwas Garh Laduna. The erstwhile M.P. of Mandsaur-Jawara Dr. Laxminarayan Pandeya inaugurated and Nanalal Patidar M.L.A., Sitamau presided. Closing Ceremany was Presided by Dr. Bhagirath Prasad (I.A.S. ), Vice chanclar, Devi Ahilya University, Indore. 75 Experts presented research papers on personality, achievements of Maharajkumar Raghubir Sinhji, and Methodology of conducting researchon Medival Indian History and history of 1857 revolution were presented. In 2007, a daylong seminar on ‘1857’ was held at Shri Natnagar Shodh Sansthan, Sitamau. Seminar was inaugurated by Prof. K.S. Gupta, Udaipur (Raj.) and Surendra Pandey presided. On May 11 and 12, 2006, a two-day seminar on ‘Invasions & Invaders of India’ was held and was inaugurated by Dr Laxminarain Pandeya MP. About 60 scholars of history participated. From January 10 to 12, 2003 A.D., a three-day national seminar on ‘Forts of India’ - (a) Their Stratagic Tactical and Practical Role in History and (b) Their future. This seminar was inaugurated by Deputy High Commissioner of India Dr TCA Raghavan and about 85 Scholars of History participated in it. On November 24 and 26, 2000, a three-day national seminar on ‘Revenue system of Madhya Pradesh, Rajasthan, Gujarat, Maharashtra and North India (from 16th to 19th century) was held. The erstwhile Public health and family welfare and public relations minister Subhash Sojatia inaugurated the seminar. About 60 Scholars of History from various regions participated. Between December 13 and 15, 1998, a Seminar on ‘Decisive battles of medieval Rajasthan, Madhya Pradesh, Gujarat and Maharashtra’ was held. Dr. Laxminarain Pandeya M.P. inaugurated the seminar. About 65 Scholars of History from various parts of country participated. Between May 15 and 17, 1996, a National seminar on ‘History of Medieval and Post Medieval Malwa, Rajasthan and Gujarat’ was held at Daly Collage, Indore. 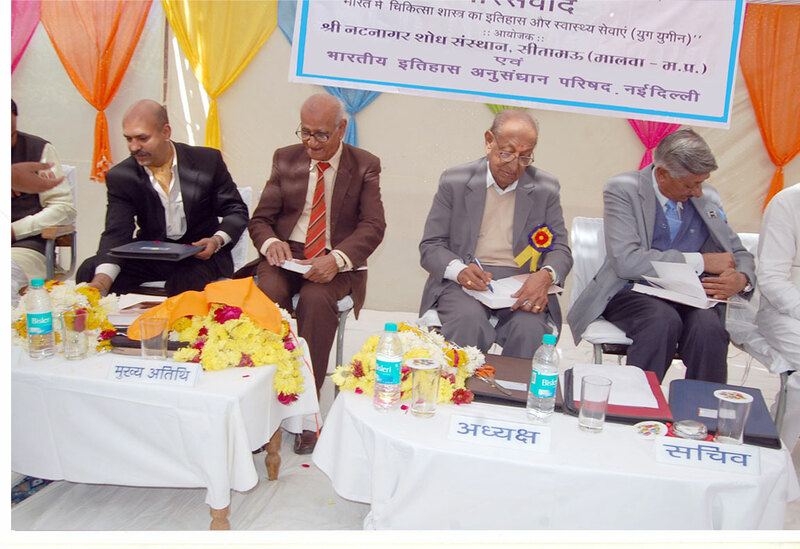 The seminar was inaugurated by vice-chancellor of Devi Ahilya Vishwavidyalaya, Indore, A.R. Abbasi and 60 experts participated in it. Between February 23 and 25, 1994, a three-day seminar on ‘History of Malwa’ and ‘Rock Art of Mandsaur (Dashpur)’ was organized. The seminar was inaugurated by eminent historian Prof Heeralal Gupta while former vice-chancellor Vikram Vishwavidyalaya, Ujjain, Prof KK Kemkar presided. About 63 historians participated in the Seminar. In November 25-26, 1991, a two-day seminar on ‘Political, Social, Economic and Cultural study of pre-modern Madhya Pradesh’ was organized. Also a symposium on ‘Cultural history of Malwa’ was held on November 24, 1991. The seminar was inaugurated by the governor of MP Kunwar Mehmud Ali Khan while erstwhile home minister Kailash Chawla presided. About 150 Scholarsof History from Madhya Pradesh, Maharashtra, Uttar Pradesh, Bihar, Haryana, Punjab, Delhi and other parts participated in the seminar. On Dec. 17-19, 1988 three day national seminar on “Social, Religion & Economic History of Gujarat, Rajasthan & Malwa during Medieval Modern period” was organised at Laduna. The seminar was inaugurated by eminent litterateur Pandit Kashiram Sharma & presided by Bharat Sinh Deepakhera erstwhile MLA of Sitamau. About 50 scholars of history from Rajasthan, Gujarat, U.P., Jammu & Kashmir & Maharashtra participated. On Oct. 25-27, 1986, a three day national seminar on “Political, Administrative, Social and Economic History of India during the Mughal-British period”. The seminar was held at Bhadsoda, Dist. Chittorgarh, (Rajasthan) and inaugurated by Maharana Mahendra Sinhji of Mewad, Udaipur, (Rajasthan). About 52 historians from various regions of India participated. On Nov. 2-4, 1985 three day national seminar on the History of Gujarat, Rajasthan & Malwa during Mughal Maratha period was organised at Raj Niwas Garh, Laduna. The seminar was inaugurated by Kunwar Sangram Sinh of Navalgarh, (Rajasthan). About 55 scholars from Gujarat, Rajasthan & Malwa participated in the seminar. On Oct. 8-10, 1984, a seminar on “Socio-Economic and Admin-istrative History of Malwa and Rajasthan” was organised at Laduna. About 60 scholars of History from all over India participated in the seminar.